Nutritionists recommend eating a cup of leafy green vegetables every day, but recent reports about the safety of fresh greens may have some wondering whether it could do more harm than good. 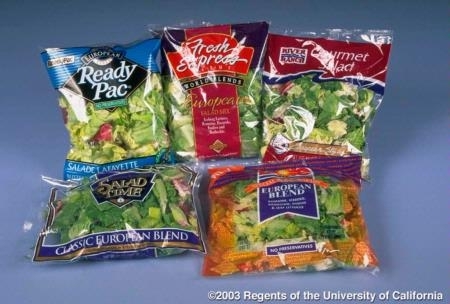 Consumers Union, the publishers of Consumer Reports magazine, analyzed store-bought prewashed and packaged leafy greens and published the results in the March 2010 issue. Currently, the FDA has no set guidelines for the presence of bacteria in leafy greens. Consumers Report said several industry consultants suggest that an unacceptable level would be 10,000 or more colony forming units per gram. The Consumers Report study found that 39 percent of their 208 samples purchased last summer in Connecticut, New Jersey, and New York exceeded this level for total coliform, and 23 percent for Enterococcus. "Although these 'indicator' bacteria generally do not make healthy people sick, the tests show not enough is being done to assure the safety or cleanliness of leafy greens," said Dr. Michael Hansen, senior scientist at Consumers Union, the nonprofit publisher of Consumer Reports. UC Davis Cooperative Extension specialist Trevor Suslow wrote a lengthy and detailed reaction to the study for Farm Safety News. He said it is unfair to consumers to raise a specter of fear well beyond what is supported by available science and our everyday shared experiences. "What I rely on for my personal confidence in regularly consuming lettuces, spring mix, and spinach salads is that there are billions and billions of servings of these items consumed every year in the U.S. alone and the predominant experience we have is of safe consumption," Suslow wrote. Check the display temperature by hand to confirm the display is cool and the bags are very cool to the touch. Look at and heed the "Best if Consumed By" date. Take notice of the display case arrangement. Bags should be vertical in a row, not laid one on top of one another in stacks. Clamshell containers can displayed in various stacking or slanted row patterns that allow generous space for airflow. Prewashed greens do not need to be rewashed at home. In fact, studies have found that home washing doesn't provide any benefit and could make the vegetables susceptible to cross-contamination in the kitchen.